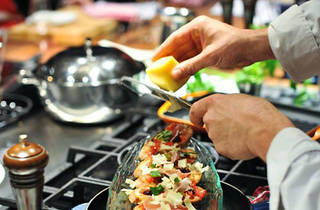 This half-day class teaches real Mexican cuisine. A young crew of noobs – mostly hombres. 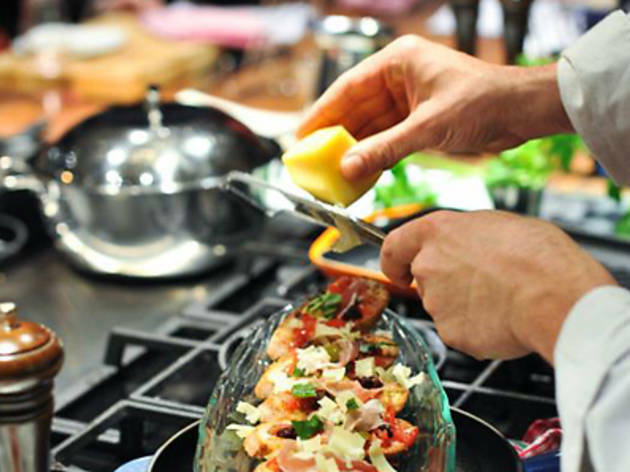 After learning about the many varieties of Mexican chillies, you’ll be split into teams to take on mole (that famously difficult chocolate and charred chilli sauce), hand-pressed corn tortillas, and your choice of main and dessert with chef Walter Trupp cutting in on a regular basis to address technique. We manage nine dishes over the morning including curries, tamales (soft cornmeal parcels, stuffed with spiced chicken and steamed in corn husks), and churros – fried dough sticks for dipping into spicy hot chocolate sauce. Your labour is rewarded with a huge feast washed down with craft beer and vino. Definitely. You’re learning about real, approachable, not-too-expensive Mexican cooking.